Three members of the Australian preschool quarter The Wiggles are hanging up their colorful costumes. Australian children's entertainers The Wiggles, Murray Cook (Red Wiggle), Greg Page (Yellow Wiggle), Jeff Fatt (Purple Wiggle), and Anthony Field (Blue Wiggle). Three members of the world-famous preschool quartet The Wiggles will be hanging up their colorful outfits and leaving the Australian band this year, with the Blue Wiggle the lone original member left dancing. 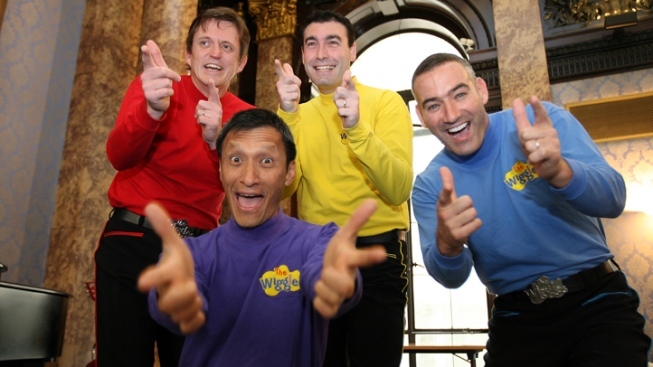 Jeff Fatt (Purple Wiggle), Murray Cook (Red Wiggle) and Greg Page (Yellow Wiggle) will leave after the group wraps up a "Celebration Tour" that begins this month and ends in Australia in December, the band said in a statement Thursday. The trio will no longer perform but will take on backstage, creative roles. Three replacements have already been chosen to join Anthony Field (Blue Wiggle), who helped found the group more than two decades ago. The demands of touring and performing have taken their toll, and the three departing members want to spend more time with their families, Cook said. "We've been entertaining children around the world for 21 years and it's important that we plan for the future so that The Wiggles can keep wiggling in the years to come," Cook said in the statement. Page, who made a surprise return to the group in January after leaving five years earlier due to illness, said it was time to move on. "When The Wiggles asked me to return to the group last year I was excited at the thought of performing with the three guys that I started the group with 21 years ago," Page said. "With Murray and Jeff's decision to stop performing at the end of the year it's a nice sense of closure to also end my time on stage during the final tour with all the original members of the group." Page, Field and Cook had studied early childhood education before they founded The Wiggles in Sydney in 1991. The band has sold more than 23 million DVDs and 7 million CDs worldwide, and its TV shows are broadcast in more than 100 countries, according to The Wiggles' website. Performers Emma Watkins, Lachlan Gillespie, and Simon Pryce will become the new Yellow, Purple and Red Wiggles, respectively.